Choosing fast food that fits into your diet can be challenging, especially when following a restrictive meal plan like the ketogenic diet. The ketogenic diet is high in fat, low in carbs and moderate in protein. While the majority of fast foods tend to be high in carbs, there are some keto-friendly options available. Here are 9 fast-food options that you can enjoy on a ketogenic diet. Typical burger meals from fast-food restaurants are high in carbs due to their buns. For a keto-approved version of a fast-food burger meal, simply skip the bun and any toppings that could be high in carbs. Popular high-carb toppings include honey mustard sauce, ketchup, teriyaki sauce and breaded onions. Swap the above toppings with mayo, salsa, fried egg, avocado, mustard, lettuce, ranch dressing, onions or tomato to cut back on carbs and add extra fat to your meal. McDonald’s Double Cheeseburger (no bun): 270 calories, 20 grams of fat, 4 grams of carbs and 20 grams of protein (1). Wendy’s Double Stack Cheeseburger (no bun): 260 calories, 20 grams of fat, 1 gram of carbs and 20 grams of protein (2). 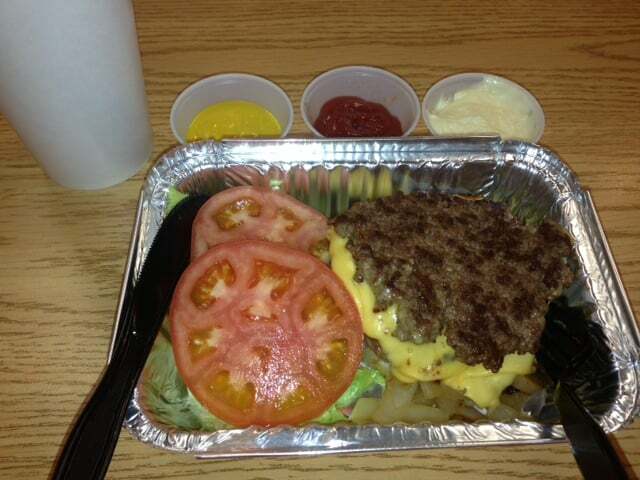 Five Guys Bacon Cheeseburger (no bun): 370 calories, 30 grams of fat, 0 grams of carbs and 24 grams of protein (3). Hardees ⅓ lb Thickburger with cheese and bacon (no bun): 430 calories, 36 grams of fat, 0 grams of carbs and 21 grams of protein (4). Sonic Double Bacon Cheeseburger (no bun): 638 calories, 49 grams of fat, 3 grams of carbs and 40 grams of protein (5). 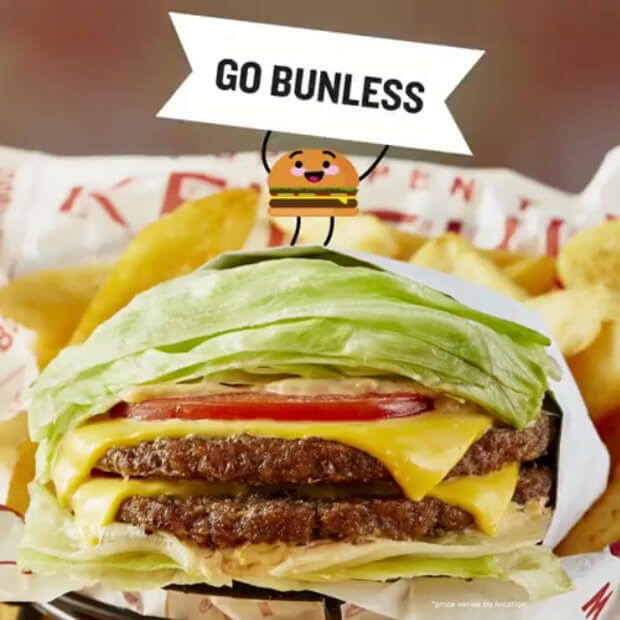 Most fast-food establishments will be happy to serve you a bunless burger. Boost your fiber intake by adding a simple side salad topped with a high-fat dressing to your meal. Summary Bunless burgers are a simple, keto-friendly fast-food that will keep you satisfied when eating on the go. Surprisingly, a single burrito wrap can pack over 300 calories and 50 grams of carbs (6). Since the ketogenic diet is very low in carbs (typically under 5% of total calories), skipping burrito shells and wraps is a must. 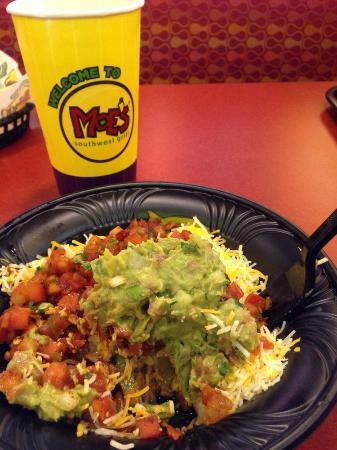 Fortunately, you can build a delicious burrito bowl without the added carbs. Start with a low-carb base like a leafy green, then add your preference of protein and fat choices. Be sure to avoid high-carb toppings like tortilla chips, beans, sweet dressings or corn. Instead, stick with high-fat, low-carb options like sliced avocado, sautéed veggies, guacamole, sour cream, salsa, cheese, onions and fresh herbs. Chipotle Steak Burrito Bowl with lettuce, salsa, sour cream and cheese (no rice or beans): 400 calories, 23 grams of fat, 6 grams of carbs and 29 grams of protein (7). Chipotle Chicken Burrito Bowl with cheese, guacamole and romaine lettuce (no rice or beans): 525 calories, 37 grams of fat, 10 grams of carbs and 40 grams of protein (7). Taco Bell Cantina Power Steak Bowl with extra guacamole (no rice or beans): 310 calories, 23 grams of fat, 8 grams of carbs and 20 grams of protein (8). Moe’s Southwestern Grill Burrito Bowl with pork carnitas, grilled peppers, sour cream, cheese and guacamole (no rice or beans): 394 calories, 30 grams of fat, 12 grams of carbs and 30 grams of protein (9). Summary Create a keto-friendly burrito bowl option by ditching the rice and beans and piling on your favorite high-fat, low-carb toppings. Choosing a keto breakfast option at a fast-food restaurant doesn't have to be difficult. Most fast-food establishments serve eggs, which are a perfect food for those following a ketogenic diet. Not only are they high in fat and protein, they're also extremely low in carbs. In fact, one egg contains less than 1 gram of carbs (10). Although many egg dishes are served with bread or hash browns, it’s easy to make your order keto-friendly. Panera Bread Power Breakfast Bowl with steak, two eggs, avocado and tomato: 230 calories, 15 grams of fat, 5 grams of carbs and 20 grams of protein. McDonald’s Big Breakfast without the biscuit or hash browns: 340 calories, 29 grams of fat, 2 grams of carbs and 19 grams of protein (1). McDonald’s Bacon, Egg and Cheese Biscuit without the biscuit: 190 calories, 13 grams of fat, 4 grams of carbs and 14 grams of protein (1). Burger King Ultimate Breakfast Platter without pancakes, hash browns or biscuit: 340 calories, 29 grams of fat, 1 gram of carbs and 16 grams of protein (11). Alternatively, ordering plain eggs with a side of sausage and cheese is always a safe bet for ketogenic dieters. If you have the time to stop at a deli, an omelet with cheese and greens is another quick alternative. Summary Egg-based breakfasts are a perfect choice for people following a ketogenic diet. Skipping high-carb add-ons like toast, hash browns or pancakes is a must. One of the easiest ways to order a keto-friendly lunch or dinner when eating fast food is to keep it simple. Ordering a grilled chicken sandwich without the bun and customizing it with high-fat toppings is a nutritious and satisfying way to stay in ketosis. The majority of fast-food restaurants have this option available — you just have to ask. McDonald’s Pico Guacamole Sandwich without the bun: 330 calories, 18 grams of fat, 9 grams of carbs and 34 grams of protein (1). Burger King Grilled Chicken Sandwich with extra mayo and no bun: 350 calories, 25 grams of fat, 2 grams of carbs and 30 grams of protein (12). Chick-fil-A Grilled Chicken Nuggets dipped in 2 servings of ranch avocado dressing: 420 calories, 18 grams of fat, 3 grams of carbs and 25 grams of protein (13). Wendy’s Grilled Chicken Sandwich with extra mayo and no bun: 286 calories, 16 grams of fat, 5 grams of carbs and 29 grams of protein (14). When ordering grilled chicken, avoid items marinated in sweet sauces, including honey or maple syrup. Summary Skip the bun and up the fat to give fast-food grilled chicken sandwiches a keto-approved makeover. 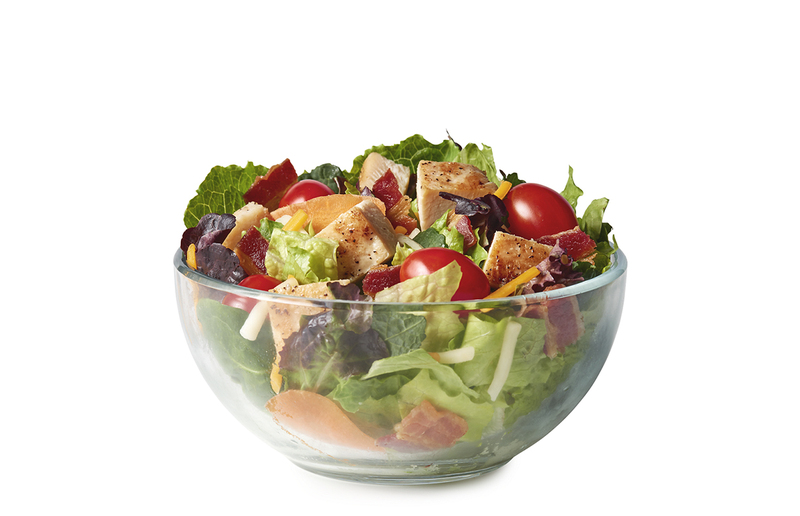 Salads from fast-food restaurants can be very high in carbs. For example, Wendy’s full-sized Apple Pecan Chicken Salad contains 52 grams of carbs and a whopping 40 grams of sugar (15). Carbs from popular salad toppings like dressings, marinades and fresh or dried fruit can quickly add up. To keep your salad low in carbs, it’s important to skip certain ingredients, especially those high in added sugar. Avoiding sweet dressings, fruit and other high-carb ingredients is key for people following a ketogenic diet. McDonald’s Bacon Ranch Grilled Chicken Salad with guacamole: 380 calories, 19 grams of fat, 10 grams of carbs and 42 grams of protein (1). Chipotle Salad Bowl with steak, romaine, cheese, sour cream and salsa: 405 calories, 23 grams of fat, 7 grams of carbs and 30 grams of protein (7). Moe’s Taco Salad with adobo chicken, fresh jalapenos, cheddar cheese and guacamole: 325 calories, 23 grams of fat, 9 grams of carbs and 28 grams of protein (9). Arby’s Roast Turkey Farmhouse Salad with buttermilk ranch dressing: 440 calories, 35 grams of fat, 10 grams of carbs and 22 grams of protein (16). To minimize carbs, stick with high-fat, low-carb dressings like ranch or oil and vinegar. Be sure to avoid breaded chicken, croutons, candied nuts and tortilla shells as well. Summary There are lots of salad options on fast-food menus. Cutting out sweet dressings, fruit, croutons and breaded poultry can help keep the carb content of the meal low. Many beverages served in roadside restaurants tend to be high in sugar. From milkshakes to sweet tea, sugar-laden drinks rule fast food menus. For example, just one small Vanilla Bean Coolatta from Dunkin’ Donuts packs in 88 grams of sugar (17). That’s 22 teaspoons of sugar. Fortunately, there are many fast-food beverages that fit into a ketogenic diet. Keeping a no-calorie sweetener like Stevia in your car can come in handy when you want to sweeten your beverage without adding carbs. Summary When following a ketogenic diet, stick with unsweetened tea, coffee with cream and sparkling water. Some fast-food restaurants have noticed that many people have adopted a low-carb way of eating. This has led to keto-friendly menu items like lettuce-wrapped burgers, which are an excellent option for people following ketogenic diets or those wanting to cut carbs. Hardees ⅓ lb Low-Carb Thickburger: 470 calories, 36 grams of fat, 9 grams of carbs and 22 grams of protein (18). Carl’s Jr. Lettuce-Wrapped Thickburger: 420 calories, 33 grams of fat, 8 grams of carbs and 25 grams of protein (19). In-n-Out Burger “Protein Style” Cheeseburger with onion: 330 calories, 25 grams of fat, 11 grams of carbs and 18 grams of protein (20). Five Guys Bacon Cheeseburger in a lettuce wrap and with mayo: 394 calories, 34 grams of fat, less than 1 gram of carbs and 20 grams of protein (3). Even if a lettuce-wrapped burger isn't featured as a menu option, most fast-food establishments can accommodate this request. Summary Skip the bun and ask for a burger wrapped in lettuce for a delicious high-fat, low-carb meal. If you are following a ketogenic diet, you should eliminate bread from your diet. Unwiches are simply sandwich fillings without bread. Jimmy John’s, a popular fast-food restaurant, coined the term and currently offers many tasty unwich options. The J.J. Gargantuan (salami, pork, roast beef, turkey, ham and provolone): 710 calories, 47 grams of fat, 10 grams of carbs and 63 grams of protein. The J.J. BLT (bacon, lettuce, tomato and mayo): 290 calories, 26 grams of fat, 3 grams of carbs and 9 grams of protein. The Big Italian (salami, ham, provolone, pork, lettuce, tomato, onion, mayo, oil and vinegar): 560 calories, 44 grams of fat, 9 grams of carbs and 33 grams of protein. Slim 3 (tuna salad): 270 calories, 22 grams of fat, 5 grams of carbs and 11 grams of protein. Some unwiches, like the J.J. Gargantuan, are very high in calories. For a lighter meal, stick to the Slim unwich options, which are all under 300 calories. Summary Unwiches are meals that consist of sandwich fillings without bread. Made up of meat, cheese and low-carb vegetables, they make an excellent meal choice for people on a ketogenic diet. Stopping at your favorite fast-food restaurant can provide you with quick, keto-friendly food, but keeping ketogenic approved snacks on hand can help tide you over between meals. Like meals, ketogenic snacks must be high in fat and low in carbs. Surprisingly, many convenience stores and gas stations have a good selection of low-carb foods. Although buying snacks is convenient, focusing on preparing homemade snacks will give you more control over the food that you eat. Investing in a cooler to keep in your car can make it easier to bring along healthy ketogenic snacks, including hard-boiled eggs, low-carb veggies and cheese. Summary Many keto-friendly snacks, including hard-boiled eggs, jerky and nuts, are available at gas stations and convenience stores. Finding high-fat, low-carb meals and snacks on the road doesn't have to be difficult. Many fast-food restaurants offer keto-friendly options that can be customized to your liking. From egg and protein bowls to lettuce-wrapped burgers, the fast-food industry is noticing the growing number of people who follow a ketogenic diet. As the ketogenic diet continues to rise in popularity, more delicious low-carb options are sure to be featured on fast-food menus in the near future.